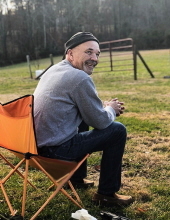 Mr. Robert Timothy “Tim” Reid, age 55 of Purlear passed away Thursday, January 31, 2019 at his home. A Celebration of Life service will be held 2:00 PM Saturday, February 2, 2019 at Mt. Pleasant Baptist Church Reach Center with Pastor Dale Jennings officiating. Burial with Military Honors by the Veterans of Foreign Wars Post 1142 will be in the church cemetery. The family will receive friends from 12:30 until 1:30 PM prior to the service in the Reach Center. Tim was born February 3, 1963 in Wilkes County to Levi Caldwell and Patsy Nichols Reid. He was a member of Mt. Pleasant Baptist Church. He is survived by his wife; Sherrie Mathis Reid of the home, two daughters; Natalie Lambert of Holland, MI and Abigail Smithey and husband Adrian of Wilkesboro, his mother; Patsy Nichols Reid of Purlear, five grandchildren; Jaxon Lambert, Madeline Lambert, Elizabeth Lambert, Noah Lenderman and Scarlett Smithey and one brother; Randy Reid and wife Cathy of Purlear and special furry friend; Derby. In lieu of flowers, “Do a Random Act of Kindness for Someone”. To send flowers or a remembrance gift to the family of Robert Timothy "Tim" Reid, please visit our Tribute Store. "Email Address" would like to share the life celebration of Robert Timothy "Tim" Reid. Click on the "link" to go to share a favorite memory or leave a condolence message for the family.